Garry Shead original Fine art Etching titled The Horse Breaker. This limited edition fine art etching print works on paper titled “Horse Breaker” is from Garry Shead and his famous Outback Series, the Garry Shead Horse Breaker series is now included in the National Fine Art Collection of the National Gallery of Australia, Canberra ACT. This Australian fine art original etching The Horse Breaker is a limited edition of 55 only and was released in June 2005. 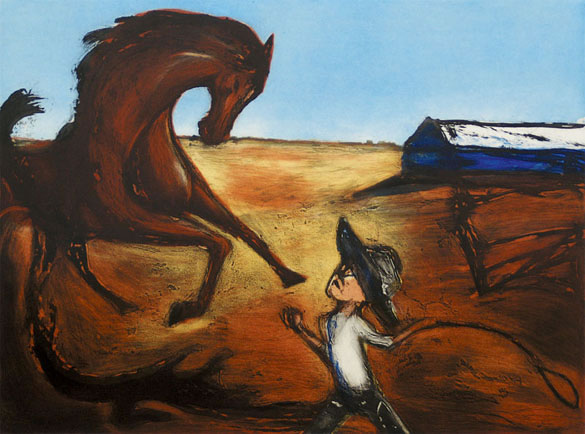 Garry Shead “The Horse Breaker” is a Multi-plate coloured etching using 6 Colours and 4 separate plates, the Image size is 45 x 60 cm and the Paper size is 72 x 79 cm. This Etching is a very moving and special piece of Artwork, signed by Garry Shead on the lower right side. Etchings titled “Horse and lady” and “Stockman’s Dream” is also in the series, all are available from Etching House at 20% deposit and 12 months to pay.